Bloom's Taxonomy forms the base of any learning outcome statement. The action verbs used in the taxonomy are measurable and discrete. Aim for learning outcomes that include skills that span across the pyramid. Although it is easy to focus on the foundations of "remember" and "understand," try to include at least one outcome that strives for "evaluation" or "creation." Vanderbilt University Center for Teaching (2015). 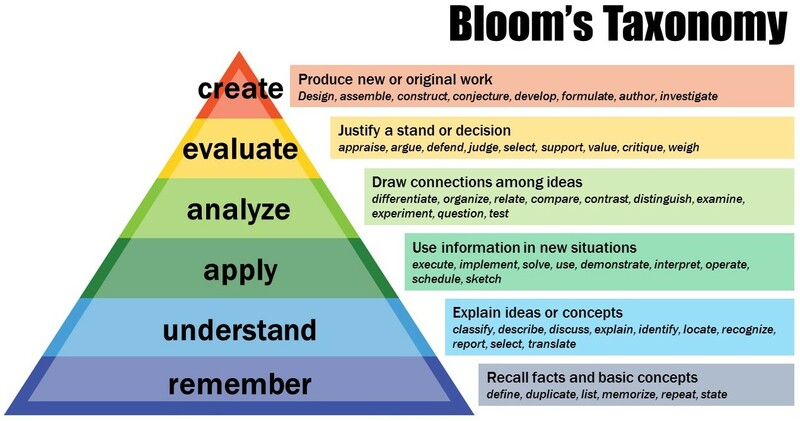 Bloom's Taxonomy. Overview of the original (1956) taxonomy and revised (2001) version. One page handout including list of verbs for each level of the taxonomy.